Of all the pasta dishes one might make, spaghetti aglio e olio (spaghetti with garlic & oil) is, by far, the easiest to prepare. Ready in minutes, at its most basic, there are but 3 ingredients to this dish: pasta, garlic, and olive oil. That’s it. Now, understandably, there are many variations to the dish, the most common involve adding grated cheese (romano or parmesan) and/or chopped red pepperoncini or pepper flakes. I am firmly planted on the side of those who love their pasta aglio e olio served with a few red pepper flakes and a good dusting of grated cheese. Still, even after adding these 2 ingredients, you can see that this is a most uncomplicated dish. As a young adult still living at the old two-flat, I’d come home after a night out with the boys and, while they were in a drive-thru waiting for their sack o’ sliders, I was already fixing myself a plate of aglio e olio. One of those nights, as I was eating, Zia’s husband, “Uncle,” came down the back stairs to see what I was cooking. After a brief chat, he went back upstairs. A week or two later, the same thing happened but, this time, he mentioned how quickly I had prepared the dish. Realizing the implication, I was ready for him the next time. A couple of weeks later, after a night spent carousing with friends, I set about to make my late night dinner, only this time I slowed things down a bit. Sure enough, Uncle appeared but this time I was just about to add the pasta to the boiling water (butta giù in our house’s parlance). I added enough spaghetti for two and within minutes we were enjoying a late night snack together. We “dined together” several times after that and I always knew that if he didn’t appear by the time I was ready to butta giù, I would be dining alone. To this day, I cannot have a dish of pasta aglio e olio without thinking of those late night dinners together. Throughout the years, this simple dish has continued to serve me well. After a 10 hour day at the office, I would arrive home and prepare a plate of aglio e olio within minutes. On those days/nights that I tended bar, a dish of this pasta officially marked the end of my day. Even now, if I don’t feel like cooking, I can whip up a batch of spaghetti aglio e olio in a fraction of the time it would take to have a dinner delivered. And I still find it every bit as satisfying as I did those many years ago, although, admittedly, Max is hardly the conversationalist that Uncle was. Check the spaghetti package’s cooking instructions. About 3 minutes before the spaghetti is supposed to be cooked al dente, begin heating the oil in a deep frying pan. Add the pepper flakes (or peperoncino) & garlic and sauté until the edges of the garlic just begin to turn brown, no more than 2 minutes. Do not allow the garlic to brown completely or, worse yet, to burn. Your pasta should be ready about now. Reserve 1 cup of the pasta water, strain the pasta, add it to the frying pan, and stir to combine and to coat the pasta. Add a few ounces of the reserved pasta water to the pan with the pasta, more as needed. Allow the pasta to finish cooking, to your liking. Before serving, take the pan off of the heat, add all but 2 tbsp of the cheese, and mix until well coated. Garnish with parsley & the remaining cheese. Serve immediately. This entry was posted in Family Recipes, Pasta/Rice/Soups (Primi Piatti), Vegetarian and tagged Cooking, Food, Italian, Pasta, Recipes by ChgoJohn. Bookmark the permalink. Thank you so very much, Kristy. Uncle was a special guy and I cherish those memories. I doubt if Zia, his wife, knows anything about those late night pasta dinners. It will give us something to talk about when I visit her next week. I’ll be sure to show her your comment, too. She loves hearing that her recipes and our “history” is so well-received, and she agrees with you. She wants me to write a book, too. We’ll see … Thanks, again. Finally making this tonight! 🙂 Can’t wait. Hey, Kristy! I’ve been away and just now got your note. I hope and you your SousChefs enjoyed it! What Kristy said. A very dear story (I am beginning to feel that I’ve known your family for years) and a very darling dish — the ultimate comfort food. Other things we like to add as the mood strikes us: anchovies, black or green olives (not green if you have ‘chovies), or, occasionally, thinly sliced peppers sauteed with the garlic…well, now we’re getting away from the simplicity of the original recipe, but the beauty of pasta is its infinite possible combinations. In Venice this spring, we had this dish with caramelized onions. It was spectacular and just stinky enough to be glorious. Thanks for letting us into your kitchen and ther meory of your Uncle. Wonderful post! Such beautiy in the simplicity of this dish. It has come to my rescue many times too. The ultimate “fast food” and way better than a burger! Love that you shared these quiet, special times with your uncle and I bet that he did too. Thanks, Tanya. This pasta is the perfect example that Italian cooking need not be complicated to be good. And if I close my eyes, I can see Uncle at the kitchen door, asking me, “What’s for dinner?” with a twinkle in his eye. What a lovely walk down memory lane with you, thank you for taking us with you and for sharing your lovely spaghetti aglio e olio too. I enjoy sharing these memories, Mandy. It seems that for every one that I write, I recall 2 or 3 other long-forgotten memories. Writing this blog has been rewarding in ways i never considered a possibility. Thank you, Mandy, and I hope yours is a great day, too. You nailed it, Cecilia, about both the simplicity of Italian cooking and a real benefit of retelling these memories. I’m glad that you enjoy reading them. By the way, it’s an Italian tradition that the first-born son bears the name of the paternal grandfather and the first-born daughter the name of the maternal grandmother. My brother’s name is that of Dad’s dad. My sister’s middle name is that of Mom’s Mom, Cecilia. Spectacular, John, and again a testament to the simple ingredients. One of my favourite dishes when we traveled through Italy. Thanks for the memories. I am out on Friday night, on the town, and I know this will come back to haunt me at 2am! Thanks, Eva. I think we can all agree that it’s not really a good idea to eat at 2:00 am. Still, if you’re going to do it — and I do — a serving of pasta aglio e olio is so much healthier than a sack o’ burgers and fries. Not only that but it tastes so much better, too! John, this is such a touching memory. I miss my family soo much (finally getting up to Ohio to see them and FALL – it’s been 11 years!!) I remember this simple pasta dish as my favorite comfort dish. This was a pasta dish my dad would make for a quick lunch. I didn’t realize the bread crumb topping was more a Sicilian style, but that is how we did it, along with the cheese! You’ve got so many warm memories to recall and that is so very special. Oh, Linda! 11 years!?!? Of course you miss your family very much. i can’t imagine but I’m so glad for you that you’ll be visiting them this Fall. That will be a very special homecoming, to be sure. It’s a funny thing how so many of my memories are associated with food, in one way or another. And I’m very thankful there are people like you who appreciate my efforts. What a nice story. I love that you eschewed bad fast food, for good fast food too. Thanks, Greg. I think you’re giving me too much credit. The truth is that I love pasta and would eat it every day if I could. Even on those nights when I joined my pals at some diner, I kept asking myself why was I eating this whatever when I could be home with a dish of pasta. The fact that it was a better, healthier alternative was just pure luck. Thanks, Stefanie and yes, these few ingredients sure do pack a wallop of flavor! That’s what I love abut italian cooking. You don’t need a laundry list of spices and a half-dozen different techniques. Less is definitely more. Thank you. Mom made this for us, too. A quick lunch or as a side dish rather than potatoes, this pasta made an appearance at least once a week on our dinner table. Now THAT’s Italian! No more cans of Chef Boyardee for me. Say, while I’m thinking about it, anything interesting coming up for the holidays? My taste buds are salivating with anticipation (pardon the pun). Yes, Chris, it is a great dish and ridiculously easy to make. I’ve not started planning the holidays, as yet. I hear that Zia may be coming into town and I need to know what’s being planned before I make plans. I’ll know in the next couple weeks. Thanks for dropping by. Another great story and background for one tasty dish. I’m going to have to speak to my wife Liz, who is almost 1/2 Italian, as to why she never made this for me. 😉 Cheers! Thanks, Jed. This is such an easy dish that virtually anyone can make it. It was the first pasta dish I learned to cook for myself and I’ve never tired of it. Why not surprise her and cook some for her? Wow! That really is easy……must try it one day. It is ridiculously easy and so very tasty. Try it. You won’t be disappointed. Guaranteed! You’re welcome. Sharing these stories helps to reminds me of just how special my upbringing was. It is funny when you wrote about your night out and eating pasta upon arriving home. We would call this “ritual” a Spaghettata!! very typical during summer, when we go out ’till late and gather with friends for a quick pasta!!! Great post!!! Spaghettata? What a great name and I can’t wait to tell Zia about this when I visit her next week. All I’ve known is that a dish of aglio e olio is a great way to end a night out. Now, thanks to you, I have a name for my late night dinner. Mille grazie. Forgot to thank you for the mention!!! I am honored!!! You are very welcome! I enjoy your blog very much and want to share it with others. I’m sure they will find it every bit as enjoyable as I have. Me anche! I find it unbelievable that so few ingredients can combine to make so great a dish. And it is perfect for an impromptu dinner/snack for the situation you described with your Venetian friends. Quick, simple, and delicious. What’s not to love? This dish is great when you’re in a time crunch or after a long day & you’re just too tired to spend even a half hour cooking dinner. For me, a pasta fanatic, it’s the best! Thanks for such a lovely but simple recipe – I love simple! And the story about your uncle is charming! What a special memory it makes! Thank you so much. Yes, Uncle was a special guy and I’m lucky to have a number of great memories of him and times we spent together. I am not Italian, but Irish descent. However, this dish was one I fell in love with when I was just a little girl… although I didn’t know what it was called back then:) I really enjoyed reading through your website and the recipes look delicious! This is one dish that really does have universal appeal. Thanks for stopping by and taking the time to comment. Glad that you liked what you saw. Don’t be a stranger! That’s great! I’m so glad you liked it. I’m leaving tomorrow to visit Zia. She’d no idea that Uncle & I were having late night pasta dinners together. This will give us something to talk about, to be sure. So many pasta dishes are based on this one dish and I love ’em all! And what a gift you’re giving your children! They’ll appreciate it more and more with each passing year, to be sure. Thank you for you kind words about my efforts here. Aside from documenting the family’s recipes, I wanted the younger set, and those to come, to know something about the people they’re going to one day see in the photo albums. Seeing Great-Grandma as a little girl can give one an entirely different perspective. Thank you for dropping by and taking time to comment. John, what an amazing base of readers you have. I believe this is because you take the time necessary to show an interest in them as well as presenting interesting and delicious recipes and family bits and pieces. I have also used the bread crumbs (although I load mine with a bit of garlic) to substitute for cheese. Today we’re making Beef Wellington. I’m using duxelles instead of pate because where we live it’s hard to find. I’m using filets instead of a chub and most probably will be hysterical in an hour. The aglio e olio is one of my favorite dishes. We offered it in our restaurant and I make it often at home. I like it because it comes together quickly and always comes through. Looks great, as always. Thank you so much, Susie, for leaving such a nice compliment. This is quite a nice community we have here on WP, isn’t it? I, too, have added garlic to the bread crumbs but usually not with this dish. Aglio e olio has quite a bit of garlic in it already. That woud be too much for even me, a person who usually cannot get enough garlic! Beef Wellington? You really do go BIG! The first time I made it was for Mom and Zia’s first visit to Chicago back in 1981. By the time I sliced into that thing, I was a nervous wreck. It turned out very well but it was years before I ever attempted it again. Well, the Beef Wellington was a success. Definitely not going to win a beauty contest as we had to finesse it but it was great! Have a good fourth. You’re right about the garlic. I suffer if I go overboard. Terrific news about the Wellington! You, too, enjoy your 4th. We’ve reached 101˚ and may go up another degree or two. Hot time, Summer in the City! Wow, a popular post and for obvious reasons! I’ve had this dish before at restaurants – why have I never thought to make it myself? It would be perfect for a quick dinner after an evening riding lesson! Thanks for sharing. You know, I remember reading somewhere that spaghetti aglio e olio is one of the dishes an Italian bachelor is supposed to know how to make due to its simplicity and ease lol. But I think that simple becomes delicious based on the care you put into it 🙂 What a lovely story. Found my way to your blog via two clicks from ‘Promenade Plantings’. This side dish was a staple in our second generation NJ Italian household on Friday nights when we observed ‘no meat’. My late mother, Eleonora, served with our fish for the week. I now make it often on its own as it’s such a comfort food full of precious childhood memories for me as well. 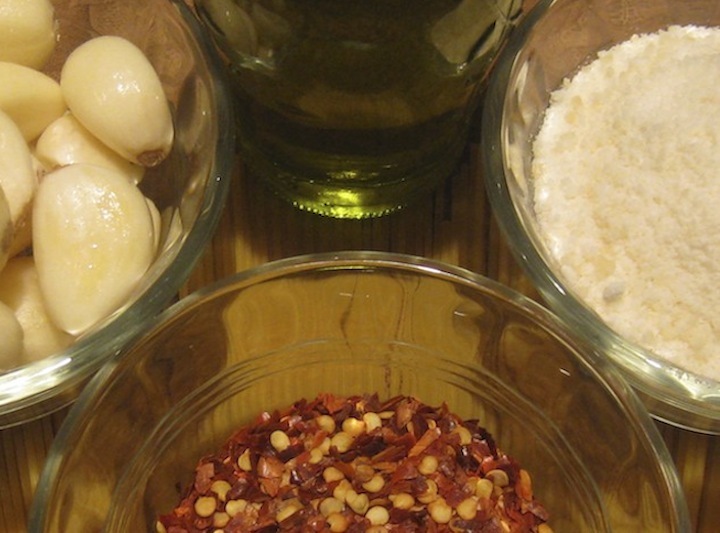 We used to fight over the softened cloves of garlic in the large bowl of pasta! I look forward to exploring more of your wonderful blog. Isn’t this a great dish? I make it all of the time and, in fact, it’s on the menu for tonight’d supper. It’s so easy to make and such a tasty dish. This is one of my go-to quick dishes (pasta cacio e pepe is another). I always add red pepper flakes too, and usually (not always) Parmesan or Romano (depending what I have on hand, and how sharp of a cheese bite I fancy that day). Fun story about your uncle. Great pictures in this – I definitely need to start adding a parsley garnish more often (it’s only a sometimes thing with me). Thanks for this. Thanks, Mo. I don’t know of many cooks that know this recipe and it isn’t a favorite. Quick and easy to prepare, what’s not to love? Good hearing from you, Mo, and hope all is well. Thanks, Meredith, that’s very kind of you. In the age of celebrity cookbooks, I don’t think “Bartolini” has the necessary cachet to go anywhere. If anything, I may try to pull some of these recipes together to create a book for Zia, though there are a few family “jewels” yet to be posted.